Vietnamese drug users detained by the police are held for years without due process, subjected to torture and physical violence, and forced to work as low- or no-wage labor in camps that are supposed to be drug treatment centers, according to an explosive new report released Wednesday by Human Rights Watch, which called for the camps to be closed and the prisoners released. 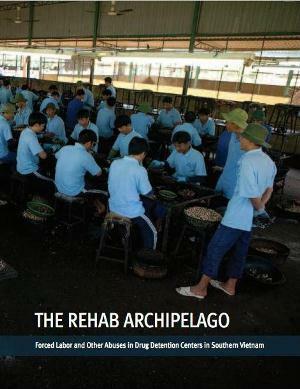 The report, The Rehab Archipelago: Forced Labor and Other Abuses in Drug Detention Centers in Southern Vietnam, documents the experience of people confined in 14 detention centers controlled by the government of Ho Chi Minh City. It found that the camps, which are mandated to treat and rehabilitate drug users are instead little more than forced labor camps where prisoners work six days a week processing cashew nuts, sewing clothes, and manufacturing other items. Those who refuse to work or who violate camp rules are subject to punishments that Human Rights Watch said in some cases amounts to torture. It cited the experience of Quynh Luu, a former detainee who was caught trying to escape. "First they beat my legs so that I couldn't run off again," Quynh said. "Then they shocked me with an electric baton and kept me in the punishment room for a month." Quynh's case is hardly an exception, said the human rights monitoring organization, which talked to numerous current and former prisoners. "People did refuse to work but they were sent to the disciplinary room. There they worked longer hours with more strenuous work, and if they balked at that work then they were beaten. No one refused to work completely," said Ly Nhan, who was detained in Nhi Xuan center in Ho Chi Minh City for four years. "Work was compulsory," said Luc Ngan, who was a minor when he began more than three years in detention at Youth Center No. 2 in Ho Chi Minh City. "We produced bamboo furniture, bamboo products, and plastic drinking straws. We were paid by the hour for work -- eight-hour days, six days a week." While workers were paid, they never saw the money, said Quynh, who spent five years at Center No. 3 in Binh Duong province. "On paper I earned 120,000 Vietnamese dollars a month, but they took it. The center staff said it paid for our food and clothes." "If we opposed the staff they beat us with a one-meter, six-sided wooden truncheon. Detainees had the bones in their arms and legs broken. This was normal life inside," said Dong Ban, who was imprisoned for more than four years in Center No. 5 in Dak Nong province. "Tens of thousands of men, women and children are being held against their will in government-run forced labor centers in Vietnam," said Joe Amon, health and human rights director at Human Rights Watch. "This is not drug treatment, the centers should be closed, and these people should be released." The Vietnamese embassy in Washington did not return a call for comment Wednesday. The system of forced labor camps for drug users originated with "reeducation through labor" camps for drug users and prostitutes established after the North Vietnamese victory over the South in 1975. They received a renewed impetus in the mid-1990s as the government launched a campaign to eradicate "social evils," including drug use. Their numbers have grown as the Vietnamese economy has expanded, more than doubling from 56 in 2000 to 123 at the beginning of this year. Perversely, international donations to support drug treatment centers and to the Ministry of Labor, Invalids and Social Affairs have enabled the regime to continue to hold HIV-positive drug users against their will, even though Vietnamese law says they have the right to be released if they are not receiving appropriate medical care. Since 1994, international donors have sought to "build capacity," including training staff in drug treatment and support for HIV interventions, but Human Rights Watch reported that most centers offer no antiretroviral treatment or even basic medical care. The group cites various reports putting the number of HIV-positive detainees at between 15% and 60% of the detainee population. The report contains testimonies from numerous detainees and former detainees who said they were sent to the centers without a formal hearing and without ever seeing a lawyer or judge. Some were sent to the camps after being arrested by police, while others were turned in by family members who "volunteered" them, believing they would get effective drug treatment there. "I was caught by police in a roundup of drug users," said Quy Hop, who spent four years in the Binh Duc camp in Binh Phuoc province. "They took me to the police station in the morning and by that evening I was in the drug center. I saw no lawyer, no judge." A small number of detainees voluntarily placed themselves in the centers to get drug treatment, but even they were not free to leave. Some reported that their detention was capriciously extended by camp managers or by changes in government policy. Human Rights Watch was unable to provide the names of any foreign companies benefiting from detainee labor, saying "the lack of transparency or any publicly accessible list of companies that have contracts with these government-run detention centers made corroborating the involvement of companies difficult." But it did cite Vietnamese media reports as saying two Vietnamese companies, Son Long JSC, a cashew processing firm, and Tran Boi Production, which manufactures plastic goods, both used detainee labor. Neither company has replied to inquiries from Human Rights Watch, the group said. "Forced labor is not treatment, and profit-making is not rehabilitation," Amon said. "Donors should recognize that building the capacity of these centers perpetuates injustice, and companies should make sure their contractors and suppliers are not using goods from these centers." Besides calling on the government of Vietnam to shut down the camps, Human Rights Watch is seeking "an immediate, thorough, and independent investigation into torture, ill treatment, arbitrary detention, and other abuses in the country's drug detention centers." In addition, it wants the government to make public a list of all companies with contracts for detainee labor. Human Rights Watch also calls on international donors to review their aid to the detention centers to ensure that it is not supporting programs that violate international human rights standards and urges companies working with the detention centers to end all relationships immediately. "People who are dependent on drugs in Vietnam need access to community-based, voluntary treatment," Amon said. "Instead, the government is locking them up, private companies are exploiting their labor, and international donors are turning a blind eye to the torture and abuses they face." A Houston, Texas, man attempting to evade US marshals seeking to arrest him on drug and other warrants was shot and killed by a Harris County sheriff's deputy last Friday afternoon. The man, as yet unnamed, becomes the 33rd person to be killed in US domestic drug law enforcement operations so far this year. According to Sky 2 News, citing law enforcement sources, a bounty hunter had tracked the man to a local motel and the US Marshals Service then tried to stop him, but he managed to escape. The man, driving a Nissan Cube, was cornered by deputies on Highway 6 at West Road. According to KHOU 11 News, citing deputies on the scene, after they pulled over the vehicle, the driver started driving, hit one deputy, and tried to flee the scene. The deputies, "fearing for their lives," riddled the car with bullets, mortally wounding the driver, who sped through an intersection, then crashed into a curb. He died shortly thereafter at a local hospital. Two deputies were injured in the incident, one who had his foot run over while directing traffic after the shooting and one was injured in a traffic accident en route to the scene. 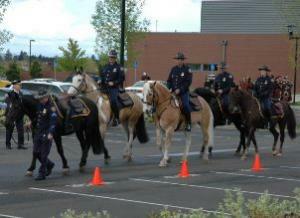 The deputy allegedly hit by the fleeing vehicle was apparently uninjured. One man who saw the shooting go down said the driver did not actually hit a deputy, but "almost" did. "I seen that cop turn his lights on and get behind the car, and I guess the car wouldn't stop. Actually, he almost ran over one of the cops and then they took fire on him. Boom, boom, boom, boom -- they shot out all the windows. I guess he got hit, and he ended up where he ended up," witness Moe Alyson told Sky 2 News. KHOU 11 News reported that the man's wife later showed up the scene, where she was informed that he was dead. Deputies said the man knew he was being watched and told his wife he would soon be dead. He was being pursued for at least four warrants, including drug possession, escape, and assault on his wife. In Nadadores, Coahuila, soldiers confiscated a massive weapons cache which included 154 assault rifles, an RPG launcher, over 60,000 rounds of ammunition and four mortar rounds. In New York City, a panel of high-profile personalities declared the War on Drugs "a failure" and called for a shift in policies, including decriminalization and a more public health-oriented response. 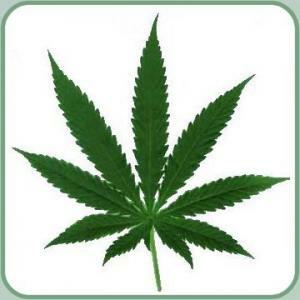 The Global Commission on Drug Policy includes several former Presidents. Former Mexican president Ernesto Zedillo was among them. In Ciudad Juarez, eight people were murdered in separate incidents. In one incident, witnesses claim that a man was killed by federal agents after having been taken into one of their patrol cars. The still unidentified man was later found beaten to death. In the town of Delicias, Chihuahua, six people were killed, including three men who were ambushed by heavily armed gunmen wielding AK-47s. In Cuernavaca, a group of marching protestors led by writer Javier Sicilia started moving towards Ciudad Juarez, where they are expected on June 10. In late March, Javier Sicilia's son was killed near Cuernavaca alongside several friends. In Ciudad Juarez, a journalist was shot and killed in a store parking lot. Alan Eduardo Rico Flores, 22, was in a vehicle with four friends when a hooded gunman opened fire on them with an assault rifle, killing him and wounding two others. No arrests have yet been made. In Torreon, 11 young people were killed after gunmen attacked a rehab clinic for drug and alcohol abuse. According to reports, at least five vehicles full of gunmen arrived at the clinic and spent about half an hour there. Two people were wounded and taken to the local Red Cross, which was soon heavily guarded by the Mexican army. In Mexico City, prosecutors said they have officially charged former Tijuana mayor Hank Rhon with illegal weapons possession. He was arrested Saturday. Soldiers discovered some 40 rifles, 48 handguns, and almost 10,000 rounds of ammunition inside his residence. Only 10 were registered, only 5 of which were registered to him. Rhon, a billionaire whose properties include a private zoo, has long been suspected of corruption. He was mayor from 2004-2007. In Nayarit, 29 people were killed during ferocious clashes between rival groups. Of the dead, 17 were found stacked in the bed of a pick-up truck. Many of the dead were wearing military-style ballistic vests and dark clothing. In the past, much of the fighting in Nayarit has been between El Chapo Guzman's Sinaloa Cartel and the Zetas. In Michoacan, over 1,800 people fled the village of Buenavista because of heavy fighting between the Mexican military and gunmen from an unknown cartel. In Texas, a Bexar County sheriff’s sergeant was killed by a gunman who opened fire on his patrol car with an automatic weapon, possibly an AK-47 similar to those favored by Mexican cartel gunmen. The incident is being investigated as possibly being connected with Mexican criminal organizations. In Apatzingan, Michoacan, a Mexican Air Force MD530 helicopter crashed during operations against drug traffickers. It was originally reported the helicopter had crashed after being struck by gunfire, but the Mexican military has denied this. In Acapulco, five gunmen were killed in a fire fight with members of the municipal police. In Saltillo, Coahuila, the offices of Vanguardia newspaper were attacked with a hand grenade. Nobody was injured in the attack, which appears to have been intended to intimidate the local media. In January 2010, Valentin Valdes, a local reporter, was executed after being kidnapped by two trucks full of gunmen. 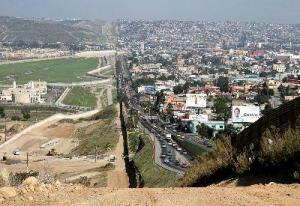 In Ciudad Juarez, nine people were murdered. Among the dead was a female who worked for the police department who was shot at a gas station. Four others were wounded, including the victim's mother and sister. In Ciudad Juarez, a girl of six years old was among five people who were murdered. The girl died in the hospital after being shot when a Jeep Cherokee pulled alongside her family's car and opened fire. Some reports indicate that a federal police patrol car was in front of the vehicle, but that they somehow didn’t notice the attack. 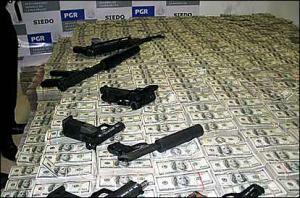 In Pachuca, Hidalgo, Mexican police arrested 25 people for being members of or helping the Zetas. Among those detained are 10 police officers, including a police chief and two senior officers. The arrests were made after suspects detained on Sunday in the nearby mountains told police that they received protection from the police chief and some members of his command. 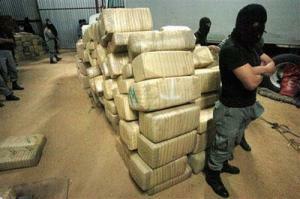 In Manzanillo, 54 tons of meth precursor chemicals were found in shipping containers which had come from China. Manzanillo is a major port of entry for precursor chemicals from Asia which are then taken to large-scale meth labs for meth production. In El Salvador, the country's defense minister said that Mexican cartels are attempting to buy assault rifles, grenades, and other military-grade weaponry from members of the security forces. Last week, Salvadoran NCO’s and four enlisted soldiers were arrested and stand accused of attempting to steal 1,812 grenades from a military facility. Northern Mexico’s drug prohibition war continues to claim victims, with more than 360 bodies discovered in mass graves just last week. The situation in Northern Mexico is devolving into chaos as prohibition-created organizations fight for control of the lucrative Northern Mexico drug route into the United States. The Mexican government is powerless to end the violence. Overpowered authorities basically have abandoned the area, recognizing their inability to restore any sort of order to the area. James Peron, President of the Moorfield Storey Institute, recounts the recent drug prohibition related death of a young husband, father, and Iraq veteran who was shot at 71 times by heavily armed men who then allegedly prevented medical assistance from being given until he was dead. The heavily armed men were from the Pima County Sheriff's Department. Another drug raid gone bad. Enriched by drug prohibition, Joaquin Guzman Loera reportedly possesses a personal fortune capable of rivalling Bill Gates and Warren Buffet. Loera is believed to be responsible for more deaths in the United States than bin Laden because of his drug transportation business and the inherent dangers associated with it created by prohibition.